NCLB and it’s effects on school ‘truancy.’ or…Pearls of Wisdom: “If our American life fails the child, it fails us all.” ~ Pearl S. Buck writer and sometime sha-woman..
“Can you hear the sounds of desperation and greed? Just listen at your local Junior High, Middle School, okay…wherever it is that those seventh, eighth and sometimes ninth graders gather and either listen attentively or play their ipods in class. George Bush has directed us not to leave any child behind.” Under this directive, (which has ironically served to leave many behind), we now have educator and school officials hamstrung to chase the buck as NCLB has tied compulsory education with a dollar value for every child attending school. Each student attending classes becomes a commodity, generating a specific dollar amount for the school. Each child not attending school becomes a liability, it’s that simple. The grey area is where there are problems. MAJOR PROBLEMS. While on the outset this correlation between dollars and attendance seems like a good way to ‘encourage’ schools to be harsh on truants, what about the kids that are really sick? Never mind those inconsistently ill kids, but what about the chronically ill? The basic idea is simple. Unload those students whose cost to benefit ratio turns upside down. Sounds simple, but it’s not. If that little commodity’s sickness is life-threatening, ongoing, and being treated and excused by a doctor, in many cases that child’s parents can and are still harassed! That is the case with yours truly, as my son was first diagnosed with H1N1 (Swine Flu – documented with a CDC approved test in a doctor’s office), and later contracted 2 bacterial infections and a few bouts of pharyngitis and tonsillitis. Even though I wrote a separate note excusing each and every day, and when applicable submitting receipts from doctor visits, the school was not satisfied. I then asked for a letter from the doctor outlining my son’s illness from the begining of his acquisition of H1N! straight through the five months that he was intermittently absent due to any of those maladies. No dice, the letter did not satisfy the school and I was called into a MacCarthy-esque meeting consisting of a Vice Principal, a school nurse, a head counselor, a truancy officer, and an attendance clerk. They warned me that I was not within school policy and the excuses i had turned in were not sufficient. 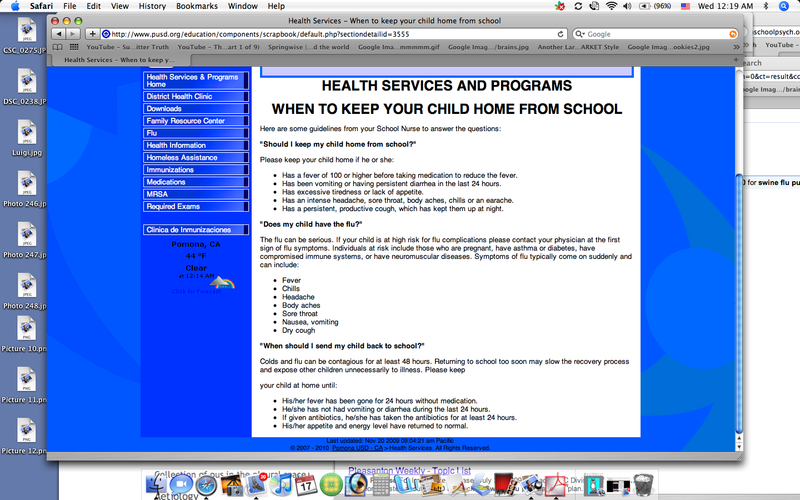 I was apparently not “allowed” to excuse my son after a certain number of absences. I did not know this, but since I already had the letter from the doctor citing my son’s ongoing illness(es) I assumed that this would be sufficient! That also was a wrong assumption! Why was i not surprised? I began to wonder whether I had fallen asleep in my car at Pixie’s Donuts where I stop every morning to say hi to “Pac” buy coffee from her and sip it before going off to one of my photography jobs… and that all of this was some sort of sugar-induced nightmare. Sadly, It wasn’t, this was reality! and I was staring right into the silvery adult braces of a 40 something truancy officer with a vest not unlike the ones worn by the BATF when they break down the door of a crack-head flop house on TLC. She was saying, “you know, Mrs. Long…you CAN send your child to school even if he has a tummy ache.” My mother whom I had brought along for moral support and also to give me the “sublime-thigh-poke-under-the-table”- should my mouth decide to compete against my brain and blurt out words or possibly expletives before my brain had a chance to listen, was promptly doing her best to make a hole in my left thigh with her index finger as I asked the truancy officer if her personally knew my son. “No, I don’t, well not personally” she said. “Well then, I suppose you don’t know that he never stayed home with a ‘tummy ache,’ he had life threatening Swine Flu and manifested cyanosis, and had fevers of 102 and well above! after that he had a bacteria which we could not kill with several courses of antibiotics, which produced cramps, vomiting, fever and chills, So, you’d be better off not talking sister!! !” Poke, poke, grimace, and then I felt a full on hard pat on my leg firmly planted in order to jolt my mouth from it’s tirade, as my brain would surely later be angry for it’s acting out of turn. I got the message but I still hoped I had sent a message. Our doctor, in the meantime, was surprised that the school was not satisfied with his letter citing compelling and obvious medical reasons for my son’s absence. The school nurse had consequently called him and specified that he refer my son to an infectious disease doctor (which was ridiculous, since he was over swine flu and the bacterial infections by then), and he ordered a chest and sinus X-ray for my son. This was done to ‘prove’ to the school that my son was not carrying bacterial Pneumonia or tuberculosis I would assume, as I don’t believe they are looking for anything that would be invasive and only a potential threat to the student such as cancer, empyema, fractures of bony structures or foreign bodies in the lungs. They’re looking for anything that might impose risk to student population which is as I pointed out earlier represents dollars for the school from the state. Now, I don’t want my student to mix with the student population any more than the next guy (er..girl in my case), and I sure as heck wouldn’t send an infectious child to school to mingle and trade lunch food with other kids, and that’s precisely why I kept my student home when and as often as I did! He’s well now, but I was only doing what the school stated they wanted parents to do! 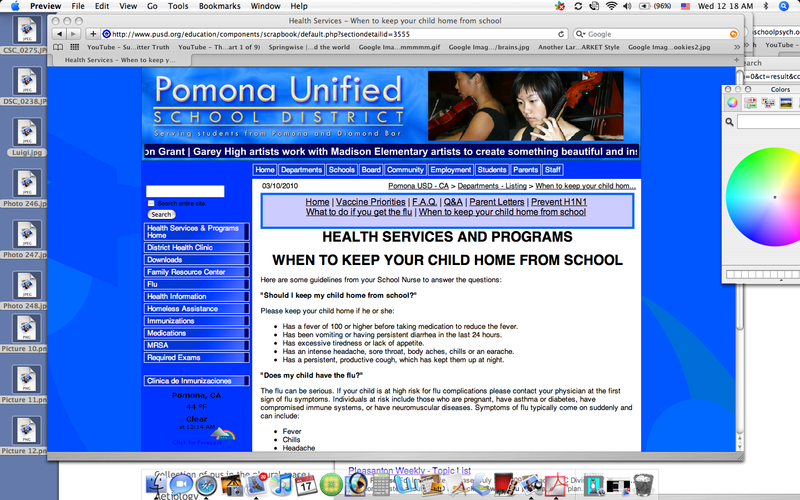 Here’s a look at what the district has on their own website! So now I have been officially threatened with litigation by a district attorney and the possibility of child welfare coming to my home. What’s next? will they threaten to put him in foster care? for what? 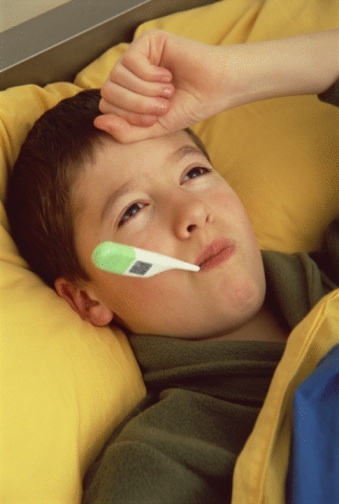 a parent taking care of their child, bringing them to the doctor, keeping him home when he clearly meets the guidelines in their “swine flu” press release and NOT sending him to school when he was afflicted with a bacterial infection, in order to allow him to heal, stay on his meds, deal with his re-curring fevers and oh! I almost forgot…KEEP OTHER KIDS FROM GETTING IT!!!! But they don’t consider any of this. This function is all about greed and NCLB is essentially re-creating the district’s schools as ‘starving dogs.’ When the focus on dollars from the state causes educators to take action against a student that is “very proficient” and making straight A’s”, whom has been justifiably excused by the doctor, What else can be the reason? Look at our economy nationally and locally. Now look at how NCLB is set up. The schools have become Attendance gestapo which works for them in some cases but not all. One size may be deemed to ‘fit all’ with regard to NCLB, but one size does NOT fit all with regard to student’s health or reasons for absence. Why did I have to suffer through a “McCarthy-esque” inquisition in their “staff meeting room?” I was the lucky subject of the attention of the Vice Principal, the head counselor, the school nurse, a truancy officer, and the formerly pink haired dusty but Jean Nate smelling attendance lady (now sporting Benecio Del Toro fangs and a sneer), The schools are starving and they are not unlike starving dogs out for blood. They do not hear protest nor justifiable reason, they will do what they want with money the only goal. Be afraid, be very afraid. required to employ period-by-period attendance accounting. (a) That the pupil is truant. attendance of the pupil at school. Article 6 (commencing with Section 48290) of Chapter 2 of Part 27.
the pupil to school and attend classes with the pupil for one day. (1) The name of each pupil who has been classified as a truant. who has been classified as a truant. pursuant to subdivision (a) of Section 48260.5. Part 27 for failure to compel the attendance of the pupil at school.